As fans of the twice-cancelled Community TV series know, creator Dan Harmon is a fan of Dungeons & Dragons and other RPGs (role-playing games). Below, watch two trailers for Harmon’s new HarmonQuest TV show, premiering on Seeso, Thursday, July 14, 2016. HarmonQuest is a live-action/animated RPG and TV series, starring executive producers Harmon and Spencer Crittenden, along with Erin McGathy, Jeff Bryan Davis and guest stars, as they play the Pathfinder RPG. Also featured in HarmonQuest are: Aubry Plaza, Chelsea Peretti, Thomas Middleditch, Steve Agee, Paul F. Tompkins, Ron Funches, John Hodgman, and Kumail Nanjiani. The entire 10 episode first season drops July 14th. Seeso is NBC-Universal’s ad-free, paid-subscription S-VOD (streaming video-on-demand) platform. The membership rate in the US is currently $3.99 per month. The first episode of HarmonQuest is currently streaming for free on Amazon. 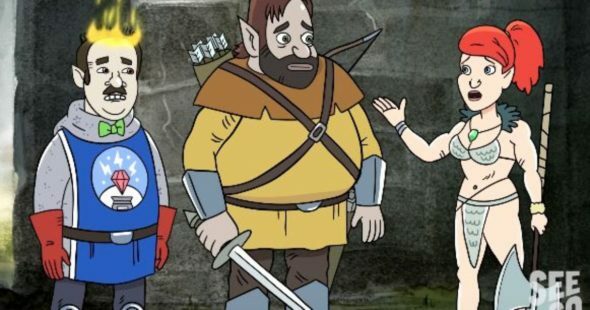 Watch this HarmonQuest TV series trailer from Seeso. Fondue and friends partake in the Festival of Restoration, but are interrupted by a barbarian chased by an evil cult. After unleashing evil upon the world, Fondue takes up a quest to save the world from the Heralds of the Manticore. Bonus: Harmon says his current favorite TV show is Game of Thrones and ties his appreciation back to his days as a young nerd, playing D&D with his friends. RELATED: Learn more about Happy City, the new comedy series Harmon is developing for FX. What do you think? Did you enjoy the HarmonQuest TV series trailers? Will you watch the first episode for free, on Amazon? Do you subscribe to Seeso? If not, does HarmonQuest tempt you to? Tell us. More about: Community, Community: canceled or renewed?, Happy City, Happy City: canceled or renewed?, HarmonQuest, HarmonQuest: canceled or renewed?, Seeso TV shows: canceled or renewed?